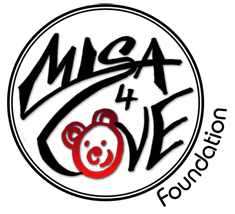 Misa Art & The Center of Independence for Conductive Education partnered to provide an art program for children with Cerebral Palsy. The final piece was auctioned off at The Center of Independence For Conductive Education’s benefit for $9,200! This partnership inspired an expanded vision; a dream to provide healing opportunities for youth around the country. 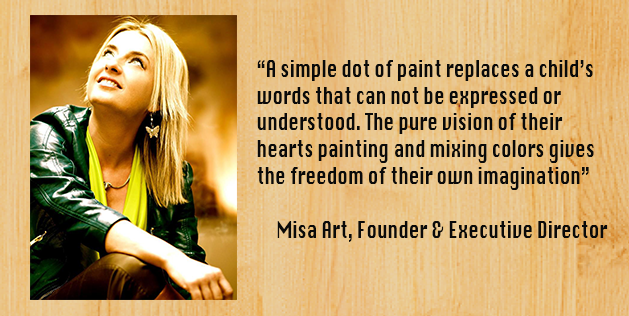 Misa For Love Foundation is dedicated to assisting children at risk through the use of artistic expression. We provide these children with a venue to express themselves artistically and implement programs designed to facilitate and direct their emotional and physical healing. We connect with organizations and hospitals assisting children at risk and bring the art programs to them. Partnering with other non profits allows us to reach more children, while simultaneously assisting other organizations in their mission. The local high school students who have been a part of the Misa For Love Foundation are on their way to becoming successful community members and through our mentorship, guidance and inspiration, M4L shows them a different perspective of life and provides the foundation to becoming well-rounded adults. Are you pursuing a career in art? M4L also provides opportunities for art students to prepare for a successful career. By sharing strategies and best practices we hope to help eliminate the “hungry artist” stereotype!